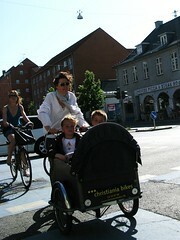 This whole blog is a Copenhagen How To, but here are some recent shots. 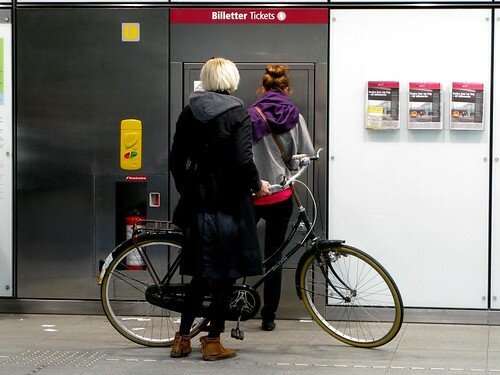 How to buy tickets for you, and your bike, in the Copenhagen Metro. How to park your bike outside a Tiger of Sweden shop. Just a quick click of your wheel lock and off you go. And remember, cyclists make better shoppers than motorists. How to transport two bottles of beer in style. The bike this chap is on is a Pedersen, or a Dursley-Pedersen. The inventor of this revolutionary bike, Mikael Pedersen, died in 1929 but in 1995 his remains were reinterred in Dursley, Gloucestershire, where this bike was made famous. Sometimes called The Most Comfortable Bicycle in the Universe. How to say good-bye to friends. A last exchange of words, the light turns green, supermum on left rides straight on, friend on right turns right. How to ride home in the afternoon. How to gently accelerate off the lights on your Short John delivery bike. We'd be fibbing if we said we weren't frightfully pleased about this article in The Guardian from yesterday. Thanks to Carlton Reid for the kind mentions and compliment. Check Carlton's bike site at Quickrelease.tv. Is posible for me to live there?? Lovely country and lovely customs! sure. if you're from an EU country, which you are, no problem. I love the color coordination, red shoes and red child seat liner. My bride would make a good Danish Lady, she is always clothing coordinated. indeed, aaron. details like that are important. I love this site. Oh that we had a culture like this in the U.S. I have noticed that when I see pics like this and in the Netherlands which has a similar culture that the use of bike helmets is very rare. The lack of helmets is because of two reasons. 1. We have safe, separated bike infrastructure. The cyclists feel safe and the safety stats reflect that our infrastructure keeps them safe. 2. As there is little concrete scientific evidence that bike helmets do anything more than save you from cuts and bruises, no European legislator worth his/her salt - in countries with a strong bike culture - would dream of promoting or legislating bike helmets. Not to mention the fact that our politicians know that bike helmet promotion and compulsion wrongly brands cycling as dangerous and causes a decrease in cyclists. See more here. In australia it's been compulsory for nearly 20 years. when they brought in the rule i was pretty cross and just ignored it until the traffic police made it too difficult not to wear one. and whilst i understand the statistical stuff about helmets and decreased number of cyclists...i recently fell off my bike. my fault - horrible interruption to a zen moment on the way home from work - landed on head and shoulder - tore my AC joint, got concussed. My helmet, not my skull got smashed. i don't under-rate their importance any more. one day when i visit beautiful copenhagen, you'll find me under a (stylish as possible) helmet. ...and i'd like to say that it had been 30 years since i had fallen off a bike...luckily i fell on my bum then! Congratulations! 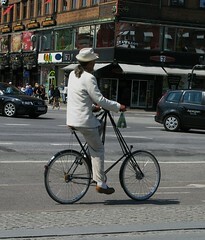 There's no wiggle room in coining you "The Sartorialist on two wheels", it's dead on. Fine, fine pictures, as always, I enjoy your social commentary just as much, giving it the proper perspective that makes this blog so great. regarding 'a helmet saved my life'. 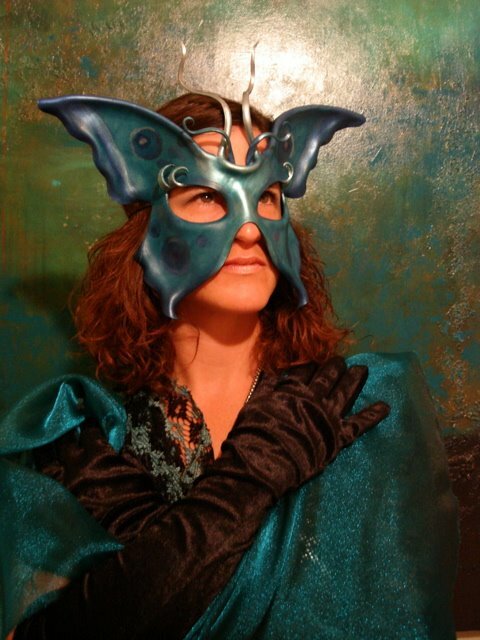 cool link to ozziecyclechic! thanks! thanks, marc. kind words. heartwarming. Thanks for the constant prodding of my great memories from my visit to Copenhagen last year. I truly love your city and I hope you realize how fortunate you are to live there. thanks so very much, ah and lp! Zak, I wonder when you will relate to your international readership the story about the danish prime minister who lost his seat because he was videotaped shortly before an election wearing a - to aggravate the fall: ill fitting and utterly unchic - OMG bicycle helmet. Do you hold it back for a special occasion? or do you think, that the world is not yeat ready for so fine a tale about politics, helmets and chic? 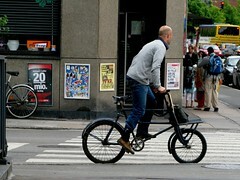 Photogoogle Poul; Nyrup; cykelhjelm. There he is. He now holds a goldlined seat in the "elephant churchyard" in Bruxelles, and some day he will revenge his downfall, when he gives his vote to paneuropean legislation dictating that all europeans from Sicily to The North Cape shall have illfitting hats to their heads whereever they go! Except if they go by car of course, because the laws are written by the car manufacturers, who btw find it best for business, that traffic infrastructure in a well planned city, country and universe can be summed up to these two elements: 1) a motor racing course and 2) the rest. 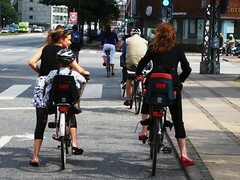 IMO there is nothing wrong with wearing a bicycle helmet of course. If you want to wear one, wear one, and if you want to become a cycle helmet missionary who preach the truth about heads uncrushed because of helmets in eternity, preach on! But there is something wrong with politicians forcing everyone to dress alike, because - to put it short - politicaly defined wear will mean the end to chic as we know it. I heart your blog. It's one of my favorite sites on the web and I've been slowing down and sniffing the flowers on my bike commute everyday thanks to you. Keep up the fantastic photo work. Thanks so much, Beth! We're slow glad to hear it! Hi Zakkaliciousness, I wanted to share with you that the US seems to be catching the cycle-wave, at least in a number of cities across the country. On June 23, the Conference of Mayors passed and adopted a resolution that bicycling should be integrated into the United States' transportation, climate, energy and health policy initiatives. And in San Francisco, the Municipal Transit Agency's count on Market Street at Van Ness Avenue showed bicyclists made up 52% of the eastbound traffic, while motorists comprised 41% between 8am and 9am. This count indicates a nearly 30% increase over the number of people biking a year ago. I personally feel like I see more cyclists on the road these days than before, but these statistics are inspiring! And congrats on such a fantastic article in the Guardian!!! thanks so much for that great news, KT!